An implant resembles a small screw and creates strong dental restorations, as they are surgically added to the bone in your jaw at the site of a missing tooth. In this way, implants can act like real tooth roots and ingrate with tissue to support permanent new teeth. Unlike full dentures, implants do not rest on or irritate soft tissue. And unlike bridges, getting an implant does not require the alteration of existing teeth; implants are the healthy choice for replacing lost teeth. Implant surgery itself is a simple procedure, contrary to what patients may believe. Dr. Talmood works with a local oral surgeon to perform the placement of your implants. After tissues have healed from implant placement, we’ll take an impression of your implants and surrounding teeth to create your restoration. Your final, implant-supported crown, bridge, or denture is added to your smile at our Fullerton dental office. When you lose the entire tooth - crown and root - shrinkage of the jawbone may cause your face to look older. Dental implants can stop this process. A traditional denture or dental bridge doesn’t. With traditional dental bridges, teeth adjacent to missing teeth are normally ground down to be used as anchors for a dental bridge. 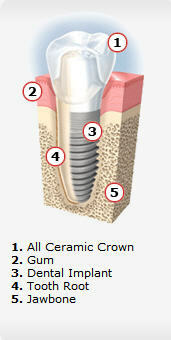 Dental implants often eliminate the need to modify healthy teeth. There are no loose parts to worry about losing. The dental implant is stable and comfortable. No adjustment is need after placement. Normally, it will serve its owner for life. Your new teeth must be cared for and checked regularly, just like your natural teeth. Brush and floss as recommended by your dentist or dental hygienist. See your dentist in six months, or more frequently if so advised. Give us a call at 714-699-9969 to schedule an appointment.